Earlier, on Thursday evening, the Mandsaur Nagar Palika Chairman Prahlad Bandhwar was shot dead from point blank range by a close aide and an alleged BJP worker in Mandsaur town. BHOPAL: A 50-year-old BJP leader Manoj Thakre was brutally murdered while on his morning walk on Sunday in Balwadi town of Barwani district, which is the home district of Madhya Pradesh’s home minister Bala Bachchan. This is the second killing of a BJP leader in four days in the Congress-ruled central Indian state within four days. Earlier, on Thursday evening, the Mandsaur Nagar Palika Chairman Prahlad Bandhwar was shot dead from point blank range by a close aide and an alleged BJP worker in Mandsaur town (around 400 km from Bhopal). The latest killing happened about a km from Balwadi town in Barwani district, as the middle-aged politician Manoj Thakre, considered close to ex-minister Antar Singh Arya was found dead in an agricultural plot close to the main road. “As usual, he (Thakre) left his house in Balwadi town at around 5.30 am for morning walk, but was found dead in an agricultural plot close to the main Balwadi-Sendhwa road, one km from Balwadi town. Deep wounds on the body suggested that he was first attacked with heavy object and weapon on the head by more than one assailant, before being dragged into the adjoining agricultural plot. Wounds on head and face and recovery of a bloodstained stone suggested that the heavy stone was used to crush his head,” said Warla police station in-charge Dinesh Kushwah. The cop added that investigations have just begun and it would be too early to speak anything about the reasons behind the brutal murder. A special investigation team (SIT) headed by ASP has been constituted to crack the case at the earliest. Coming to know about the incident, ex-MP cabinet minister Antar Singh Arya was on way from Bhopal to Barwani to meet the bereaved family. “I’m on way from Bhopal to Barwani, it would be difficult to say anything right now about whether the killing could be political or not,” Arya told The New Indian Express. As many as three high-profile murders have jolted MP’s Malwa-Nimar region, since the alleged contract killing of 40-year-old builder Sandeep Agrawal on a busy street of Indore (close to a police station) on Wednesday evening. 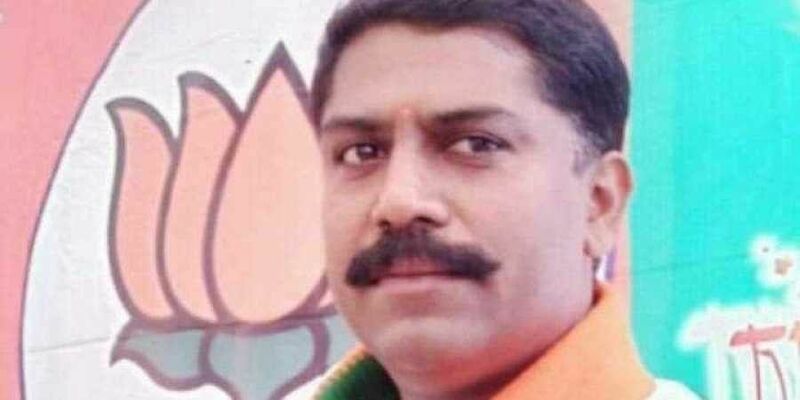 A day later, Mandsaur Nagar Palika chairman and BJP leader Prahlad Bandhwar was shot dead by close aide Manish Bairagi in Mandsaur town and now another BJP leader Manoj Thakre has been brutally killed in Barwani. After the Thursday evening killing in Mandsaur (in which the accused have been arrested from adjoining Rajasthan), the former CM Shirvaj Singh Chouhan and present CM Kamal Nath had traded barbs. While the former CM wrote to Nath alleging that law and order situation was deteriorating since Congress came to power in MP, Nath responded to Chouhan in written asking not to play politics on murders, particularly when one of the killings have been committed allegedly by someone from within the opposition party only.